Is this what implosion looks like? Bill Shine & Jesse Watters hopefully about to get hit by a train. The House Intelligence Committee has reportedly agreed on a witness list for its investigation into Russia’s interference in the 2016 election that includes somewhere between 36 and 48 people, CNN reported Wednesday night. Included on the list are current and former associates of President Donald Trump believed to have been in contact with Russian officials during the campaign or transition period, including Trump’s son-in-law, Jared Kushner; Trump confidante Roger Stone; former national security adviser, Michael Flynn; and early Trump campaign adviser Carter Page, according to CNN’s Anderson Cooper. Blame Matt Yglesias for setting off Monday’s torrent of fake news about Chelsea Clinton with a tweet suggesting she’s running for office, which of course she’s never said she’s doing. You can click over there and read the collection of tweets (because I still can’t figure out how to embed tweets here). I want to focus on some of the male journalists who have nothing more important to do than to diss Chelsea. Among them: the aforementioned Matt Yglesias, Josh Barro, and CNN’s new hire Chris Cillizza. Chris Cillizza indicates the size of their collective weewees as Matt Yglesias and Josh Barro look on. 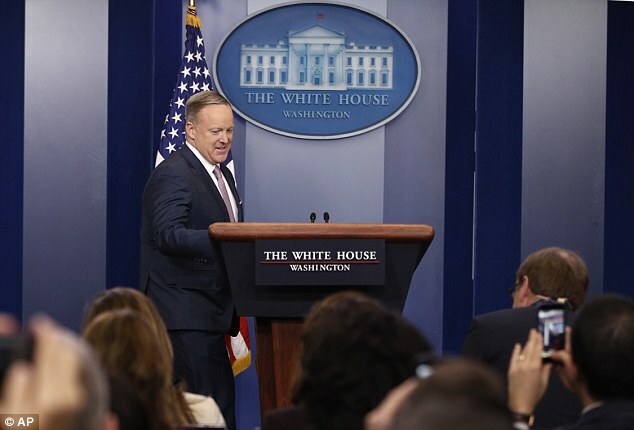 White House press secretary Sean Spicer may have a penchant for putting his foot in his mouth (for example, what he has said about the Holocaust), but a new report suggests President Donald Trump won’t fire him because the man gets great ratings.